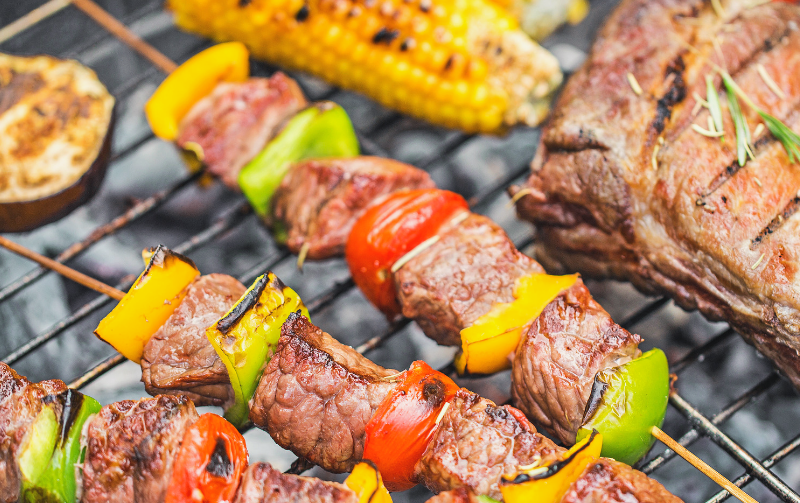 With the warmer spring weather comes one of my favourite seasons – barbecuing! There is nothing better than hot off the grill meats and veggies with that smoky aroma and allure of cooking with fire. While only a small portion of us use our BBQ’s weekly, we are now grilling three times more than our grandparents. And barbecuing is still among our favourite ways to headline an outdoor party. When entertaining, we are looking to go beyond basic burgers and brats, looking to healthier and more sophisticated options, including fish, vegetables and even fruits. We also have some saucy ideas about how to spice things up with new techniques to flavour grilled foods. Marinades have long served a functional value in cooking meat (containing acidic ingredients, such as vinegar or lemon), to break down proteins and tenderize the meat. But now they are also highly prized for adding great new flavours and even serving as a dipping sauce on the side. According to Elizabeth Karmel author of Soaked, Slathered, and Seasoned: A Complete Guide to Flavouring Food for the Grill, the key to “next level grilling” is thinking beyond a simple marinade as a “flavour accessory.” Karmel groups flavour accessories into four groups: Marinades, Rubs, Mop Sauces and Barbecue Sauces. Whatever your preferred cut of meat or grilled veggie is this season, add your own flare it and impress the neighbourhood with the aroma of goodness…just watch your eyebrows in the process! Marinades are a liquid mix of fats (oil) and acid, used to flavour and tenderize the meat. They are best with leaner or blander foods, such as chicken breast, pork chops and veggies. Rubs are typically a powder or paste containing herbs and spices that form a crust on the food. They are best with fattier meats such as pork, lamb and salmon. Mop Sauces are liquid and contain ingredients like tomato sauce and beer. They add moisture during low heat, slow cooking and they work best with tougher cuts of meat, including ribs and brisket. 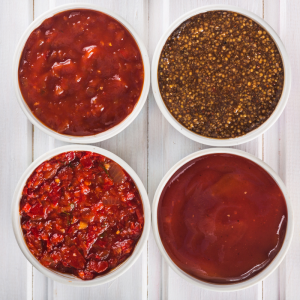 Barbecue sauces are a thicker liquid that often has some sweetness. They add flavour and a caramelized coating and work well on most anything. Soaked, Slathered and Seasoned: A Complete Guide to Flavouring Food for the Grill, by Elizabeth Karmel; in Rubs and Sauces, Epicurious.com.